Two New Science Kits: Photosynthesis & Pendulums! As an extension of our ‘6 Signs of a Bad Telescope’ its time to cover those instruments that see the very, very small. 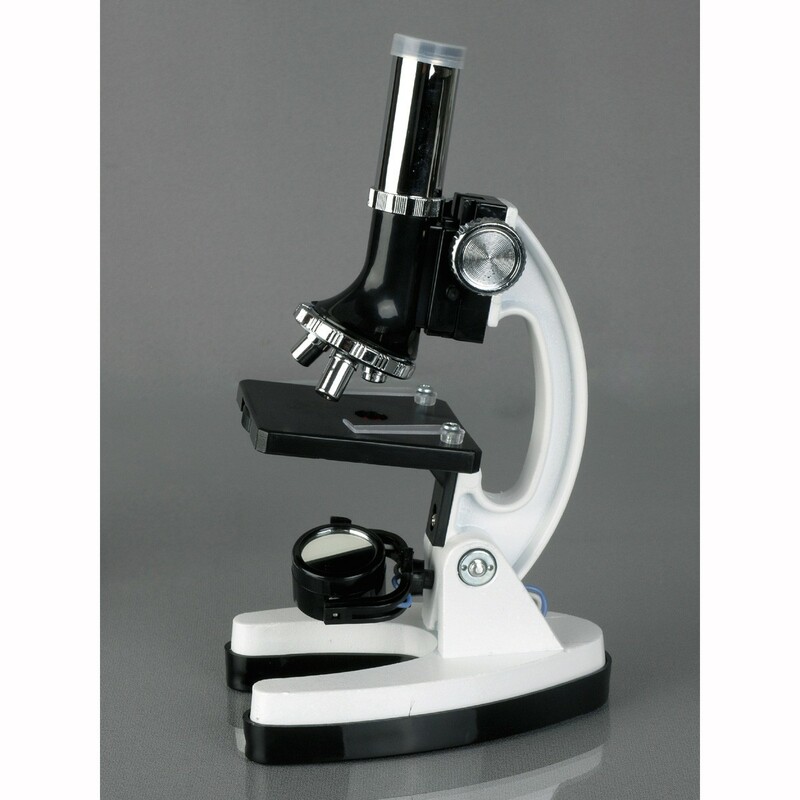 Not all microscopes are created equal so its time to cover some of those indicators that the microscope you are looking at may not be the best one available! Unlike the telescopes, this one is a bit more subtle as many low cost microscopes can go up to 400x magnification without issue. But above 400x the image simply is not going to be clear on a cheap microscope. If it advertises itself as have powers above 400x that model had better be professional grade! A typical bad microscope magnification listing seems to be 900x for some reason. Fact is: When you are using that much power on a microscope you also need to be using something called immersion oil – which is an oil you put between the slide and the lens. This is needed because the change in index of refraction (which is how much the light gets bent as it travels through something) between glass slide, air and then glass lens is too much. So don’t be fooled by lies on the box. OK, microscopes that use mirrors can be retro for an experienced user who wants the old-school experience, but for budding young biologists mirrors can be very tricky to use. Especially the mirrors on a cheap microscope. They will cause endless amounts of frustration for a young user and adults won’t be very happy about it either. In this era of microscope construction there is no excuse for having models without a light. LEDs are low cost, low power, and long-lived. Any beginners microscope should have one. This is not to say that any cheap microscope with a light is automatically home-free. There are plenty of microscopes with poor lighting as well. 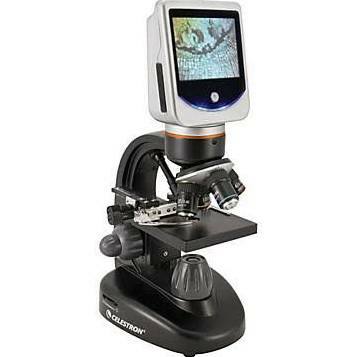 This one is actually being reduced in usage so it is very hard to find an example to show you, but we can show you a digital screen microscope, which is actually a good version of what we are discussing. Digital images can be lots of fun, sadly a lot of cheap microscopes may use an old optical projection technique that frankly….stinks. It can be done right and projection microscopes are fun to build as a science project (note: link is a .pdf) but for low-cost microscopes the best you can hope for is a murky, distorted image. 4) That tacky, plastic, angled body! Ugh. Just ugh! Cheap molded bodies with casting lines still visible, silvery colored plastic pretending to be metal, or worse. Microscope like this have issues that may not occur to most people: They lack the weight to hold still when being adjusted, they are based off old mirror designs (which does nobody any favors), they can actually melt a little the heat (especially with the dirt cheap models). This is not to say that all plastic-bodied microscopes are bad. In fact some models have to be made out of plastic due to conductivity issues, but this is usually a tougher plastic. Cheap plastic models simply have too many issues for long term use: the focuser strips easily, the bodies warp over time, plastic does age well. Plastic bodies also tend to mean plastic lenses, which are a problem of their own. If you give someone a beginners microscope, it is reasonable to expect there might be a small start kit of accessories that comes with it. This is a good idea so that new students can use their microscope right away. A good starting kit might have the following: some premade slides, a few blank slides, cover slips, tweezers, slide stain, and perhaps a specimen jar. The things you don’t need with a start scope would be: color filters, dissection tools (usually dull and dangerous), and other nonsensical items. Many of these models are sold in packs like you see in the first picture of this entry which is trying to impress you with all the ‘stuff’ it comes with. Don’t get fooled. Its not very hard to separate the wheat from the chaff with microscopes – certainly it is easier that with telescopes. 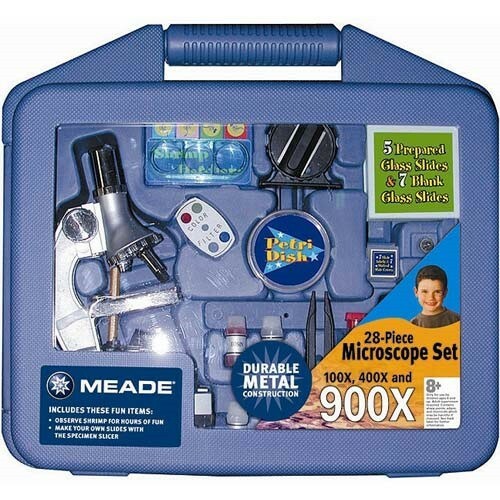 Just remember that bargain microscopes may not be a real bargain. 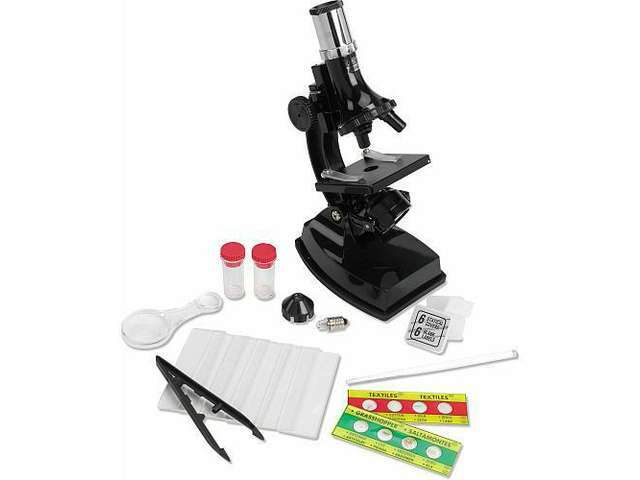 Want to buy beginner Microscopes? 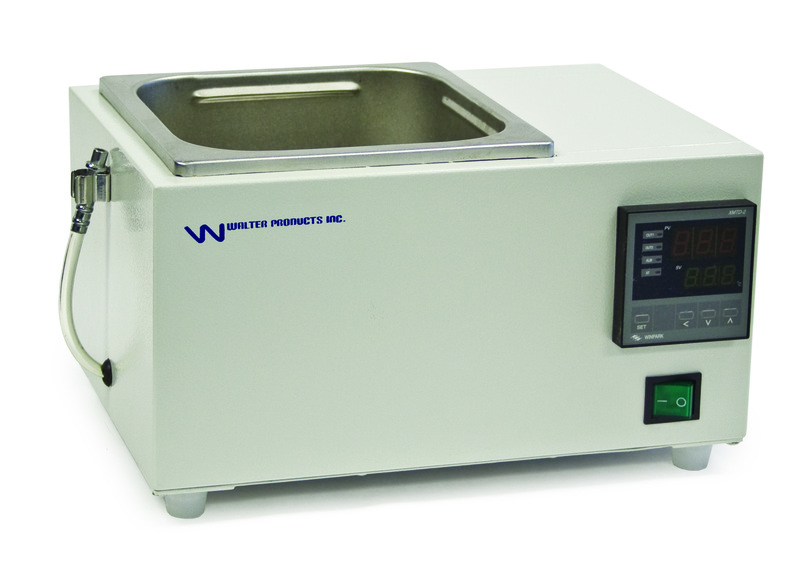 Walter Products has offered some excellent low-cost Water Baths that are good for start-up labs, Universities, and High schools. They were not precision instruments but their low prices filled a niche that many institutions found quite useful. While not critically ugly, the Water Baths were a bit on the bland side. Mind you, this is usually not a major issue for the average lab-user. But on the other hand if you can get a better appearance without any major changes to costs, then why not?